So what's the issue? Several recent studies have shown that Dreamfields pasta produces the same blood sugar level spikes as traditional pasta - holy cannoli! While this is disappointing news for those trying to lose weight by following a low-carb diet featuring Dreamfields pasta, for diabetics who have been told this is a "safe" product, ingestion can cause blood sugar spikes with serious consequences - like slipping into a coma. 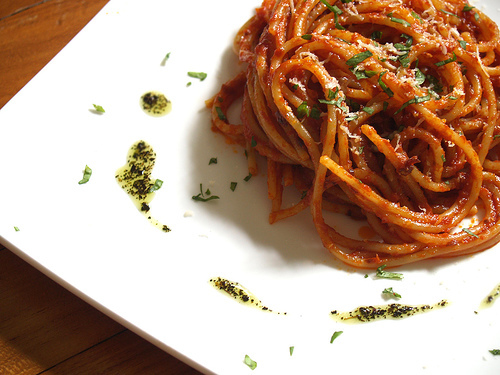 While it would generally take more than one meal to trigger these results, including Dreamfields pasta on a regular basis can be a harmful indulgence. Where's the data? Well, Dreamfields doesn't have it, but Dr. Mary C. Gannon, Ph.D. and Dr. Frank Nuttall, M.D., Ph.D. do. The two low-carb researchers conducted a controlled study on the effect of Dreamfields pasta on blood sugar levels of healthy adults. 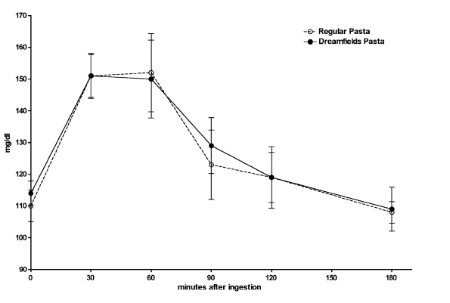 They tested two separate groups of five healthy adults, the first were "old people" and the second "young people" and the results were the same: Dreamfields patent-pending protected carbs have the same impact on blood sugar levels as regular ol' pasta (see above graph). Yikes.